Jendzjowsky, Lidia. "Edna Elias". The Canadian Encyclopedia, 09 November 2016, Historica Canada. https://www.thecanadianencyclopedia.ca/en/article/edna-elias. Accessed 24 April 2019. Elias began her career as an elementary school teacher in Kugluktuk and Arctic Bay in 1980, and at the same time was the head of the language bureau of what was then still a part of the Northwest Territory's Department of Culture and Employment. 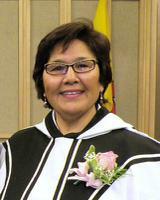 Edna Elias was sworn in as Nunavut's 4th Commissioner in 2010 (courtesy Government of Nunavut). 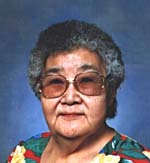 Edna Elias, teacher, educator, politician, fourth commissioner of Nunavut, from 2012 to present (born in 1955 in what is now Kugluktuk, Nunavut). Elias has dedicated her life to the promotion of Inuit culture, overseeing the delivery of Aboriginal and Official Language services for the Government and Legislative Assembly of the Northwest Territories, and founding the Edmonton Inuit Cultural Society. She has also owned and operated her own interpretation, translation and consulting business. Elias began her career as an elementary school teacher in Kugluktuk and Arctic Bay in 1980, and at the same time was the head of the language bureau of what was then still a part of the Northwest Territory's Department of Culture and Employment. She has also served as the Director of this Department, co-chaired the Northwest Territories Aboriginal Language Task Force, and has worked as an Inuktitut-language interpreter and translator for the Nunavut government and legislative assembly. 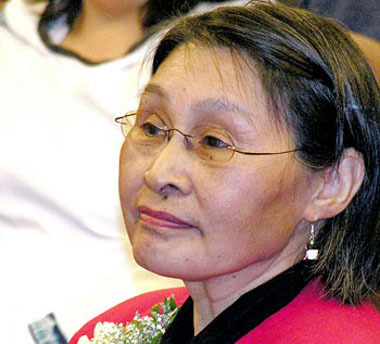 During the 1990s, Elias continued her work in education as a school principal in Kugluktuk and also as Executive Assistant at Nunavut Tunngavik Inc in Cambridge Bay. In 2000, Elias became the Supervisor of Family and Community Support Services in High Level, Alberta. Following this, she worked in child and community development in the Northwest Territories. Elias worked closely with the newly formed government of Nunavut following its inception in 1997. In 2009, she was appointed to Inuit Uqausinnginnik Taiguusiliuqtiit (the Inuit Language Authority), and she worked as an Inuktitut interpreter and translator in the Legislative Assembly of Nunavut and in surveys of Nunavut residents. It was in this role that Elias worked for the Nunavut Department of Executive and Intergovernmental Affairs to help conduct a survey with residents to address housing needs of Nunavut residents. In 2011 Elias, along with Elisabeth Hadlari, Donna Olsen-Hakongak and Crystal Qaumariaq, Jeannie Ehaloak (all of Cambridge Bay) and Jamie McInnis (Calgary) announced that they were going to raise $70 000 for the Alberta Cancer Foundation to help support breast cancer research and the Cross Cancer Institute in Edmonton, Alberta. Their goal was to walk from Coronation Gulf from Umingmaktok to Cambridge Bay, approximately 250km (160 miles). Departing in May, their endeavour took approximately 6 days to reach Cambridge Bay in time for the Frolics event on Victoria Day weekend. On 12 May 2012, Elias was appointed the fourth Commissioner of Nunavut, succeeding Ann Meekitijuk Hanson. Commissioners are federally appointed positions, and fulfill roles similar to that of a provincial lieutenant-governor.